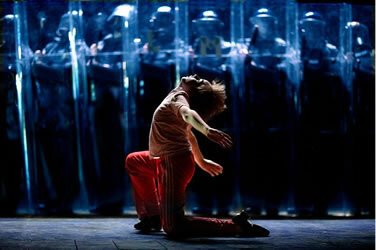 This page provides information about going to the theatre in London and elsewhere in the UK. The most famous location for theatre in the UK is in London's West End (the British equivalent of New York's Broadway). Tickets can usually be booked several months in advance (they may be on sale more than a year in advance for very popular shows which are certain to run for a long time). A typical price range for tickets to a West End show is £25 - £75 per person. Group rates may be available, typically for 10 or more tickets to the same show. The top-price seats in the best locations and the cheapest seats are usually sold out earliest. The highest priced tickets are sometimes sold at a discount to make sure that the theatre is full during less busy periods. When you book tickets you can choose either to have them posted to you at a UK address (make sure that you allow enough time to receive them), or you can choose to pick them up at the theatre's box office. When you book online have a look at the seating plan in the theatre, so that you know exactly where you will be sitting (there are links to seating plans in the theatre table below). In some seats the view of the stage may be restricted by pillars (supporting the upper levels), rails (for safety, at the front of the upper levels), or by an overhang (at the back of the lower levels). In the front couple of rows you may need to look up at the performers (row A is not always the front row - some theatres have temporary rows such as AA or BB in front). For concert-style musicals you may want to avoid sitting too close to the speakers (often located on either side near the front of the stalls). If you suffer from vertigo (a fear of heights) you may prefer to avoid the upper circle or balcony. Most evening shows start at about 7:30pm and finish before 10:30pm. Combined theatre and restaurant packages are sometimes available: these include a pre-theatre meal at a nearby restaurant. It can be difficult to get a taxi after a show, so it may be easier to walk to the nearest Tube station to go back home. Many performances have a couple of afternoon performances each week (known as matinee shows), most commonly on Wednesday or Thursday and on Saturday. Matinee performances are typically from about 2:30pm to about 5:30pm. Most theatres don't have performances on the evening of Christmas Eve (24th December) or at any time on Christmas Day (25th December), but are usually open on other UK public holidays. Friday and Saturday evening performances are usually the most popular, so you may get better or cheaper seats at other times. A limited number of theatres put on Sunday shows. Peak periods are the school holidays and main tourist seasons, in particular around Easter (March/April), summer (July/August) and Christmas (December). School half-term holidays are also busy. 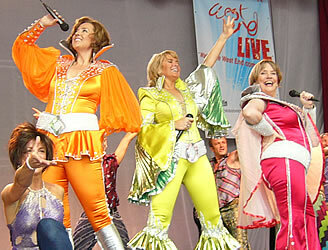 Below is a list of some popular West End musicals in London. You can book tickets by clicking on the show's name (for other shows please use the link above). Stage adaptation of the famous Hollywood musical film. Those sitting in the front rows may get wet! Was the Wicked Witch of the West really so evil, or just misunderstood? A selection of a few popular long-running plays is shown below. You can book tickets by clicking on the show's name (for other shows please use the link above). The main West End theatres are listed below in alphabetical order. Click on the theatre name links to buy tickets at that theatre. Click on the "seating plan" links to find where seats are located (by row letter and number). Click on the "map" to see the location of the theatre (or see the following: West End theatre map). You can buy half-price tickets for some plays or musicals in London by queuing at the TKTS building in the middle of Leicester Square (10am - 7pm, Monday to Saturday, and 11 - 4pm on Sunday; map). The tickets are only for performances on the same day. Note that half-price tickets are only available for the most expensive seats (for example £30 instead of £60), you cannot choose your seat, and you are unlikely to find tickets for the newest or most popular shows. Each day the shows for which half-price tickets are available are listed on a board or electronic display outside TKTS, and are also shown on this website: http://www.tkts.co.uk/whats-on-sale. Some tickets are available with a 25% discount, and others may be sold at full price. There may be different boards and queues for matinee (afternoon) and evening performances, so make sure you join the correct queue. There is a service charge for each ticket (in 2010: £3 per ticket). Tickets can also be bought at a second TKTS office which is located at Brent Cross Shopping Centre. 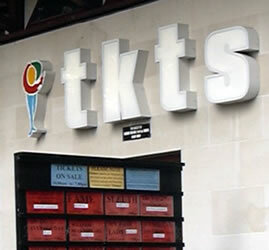 TKTS is the only official ticket shop, organised by the theatres. Be careful if you buy tickets from other ticket shops around Leicester Square which advertise half-price or discount theatre tickets or claim to be "official". Make sure that you ask about the booking fees before you buy tickets. Check the location of your seats: you may not be able to see much if the ticket is marked "restricted view". Always ask what the face value is of the tickets you are being sold. Do not buy tickets from touts (US English: scalpers) outside a theatre. Standby concessions: Some theatres will offer unsold tickets cheaply to students shortly before a performance at the theatre's box office. You will need to show student identification, usually an ISIC or NUS card. Depending on the theatre, this offer may also be open to senior citizens or other types of "concessions". Standing tickets: A few theatres have some very cheap tickets for people who are prepared to stand at the back of the balcony (at the top of the theatre). Day tickets / lottery tickets: Some theatres keep back a limited number of tickets to be sold cheaply on the day of a performance (often in the front row of the stalls). These will go on sale at a certain time, usually either when the box office opens or a couple of hours before a show. There may be special conditions such as a maximum of 2 tickets per person, or payment only in cash. Usually these tickets will be provided on a first-come basis, but occasionally a theatre will issue a lottery ticket and only people who are chosen at random can buy the discounted tickets. Returns: If all the tickets have been sold, it may be possible to buy "returns" at the theatre's box office shortly before the performance (these are tickets from people who cannot go and who have returned their tickets directly to the theatre). These may be offered either at full price or at a discount. Each summer there is a special theatre promotion in London called Kids Week. This is usually in the second half of August, and booking for this offer opens in the middle of July. For this offer an adult paying full price can take one child aged 5-16 for free to a range of participating West End shows. You can also buy tickets for up to two other children for half price. For each show only a limited number of tickets are available at these special prices, so early booking is recommended. Some shows make more tickets available later, so if not tickets are listed it may be worth checking again later. A number of theatres also put one some special children's events (such as dance workshops, drama activities or meet-the-cast opportunities). There are only a few places and these need to be booked separately. Mousetrap Theatre Projects is a charity which organises special events to help young people in the UK to experience theatre. If you are aged 15-18 and are studying at a UK state school/college there are opportunities to see a London theatre show for just £5 through the C145 scheme. If you are aged 19-23 (or if you are studying performing arts) there are opportunities to see a London theatre show for just £10 through the WestEnd410 scheme. If you are a teacher who may bring groups of students to the theatre there is a Teacher Preview Club. Each year there is a special West End theatre promotion called Get Into London Theatre. A limited number of specially priced tickets are available for a range of plays, musicals, operas and dance performances in London. Tickets generally go on sale starting in early December, for performances between the start of January and mid-February. Tickets are available for £10, £15, £25 or £35 (with no booking fee), depending on the show and the location of the seats. Ticket agencies often offer packages which combine both a ticket and a pre-theatre or post-theatre meal. London theatres which have spare capacity for a show may offer tickets to an audience-filling service. To join one of these you may need to pay an annual membership charge. Note that the numbers of members is limited, so there may be a waiting list to join. Members pay only a small administrative charge for each ticket booked. There are many other excellent theatres throughout the UK. Tickets for these shows are usually cheaper and the theatres are often smaller. A wide range of styles and new works are performed, which may not attract big enough audiences to fill the larger theatres. - There is not normally a strict dress code, except perhaps on a first night or special performance. If possible wear either smart casual or formal clothes. Don't wear large hats. Avoid wearing strong perfume. - Try to arrive at the theatre 30 minutes before the start. This is especially important if you need to pick up your tickets from the theatre's box office. You cannot usually enter the auditorium until about 30 minutes before the show starts. - Put any large coats or bags in the cloakroom. Smaller coats or bags may fit under your seat or on your lap. Avoid putting things over the seat in front or next to you unless you are sure that nobody is using these. - Order your interval drinks at the bar before the show starts. This will enable you to get your drinks quickly, and will avoid delaying others. - Do not take drinks from the bar into the auditorium unless the theatre allows this (some theatres allow drinks in plastic cups - not in glasses, for safety reasons). It should be OK to take a small plastic bottle of mineral water. - If you are very short or are taking a young child with you, on arrival at the theatre ask a member of staff if a booster seat is available for you (you place this on top of your seat to make it higher). - Get to your seat on time. Bells announce when it is time to make your way into the auditorium. - If you arrive late or need to leave your seat during the show, choose a time which does not disturb the performance. - If you have more than one ticket, check the heights of the people sitting behind you and if possible try not to block the view of a child or short person. - Sit in the seats shown on your tickets. Do not move to another seat even if it is empty at the start of the show - that person may arrive later. - Do not take your own food into the auditorium. If you eat sweets (for example to control a cough), unwrap them before the performance. Ice creams are often sold during the interval (the spoon is usually inside the lid). - Note that there can be long queues for toilets (especially for the ladies), so make sure that you allow enough time for this either before the show or during the interval. Some shows do not have an interval. - Stand up to allow other people to go past you to get to their seats (unless the performance has already started). - Turn off your mobile phone during the performance. Even if a phone is set to silent mode, do not check messages during the show. Note that screens which are lit will distract people around you. - Do not take any photos or video/sound recordings inside the theatre, even before the start or at the end of the show. This is not allowed, even if you do not use flash. - Do not talk or hum during the performance - it will annoy the people around you (even if you whisper, they will hear you). The performers will indicate if they want you to clap or sing along during part of a musical. - Sit back in your seat during the show, as you are more likely to block someone's view if you lean forward. Try to sit still. - Do not smoke, even in the bar areas or toilets [since July 2007 it is illegal to smoke in enclosed public spaces in any part of the UK]. - Do not offer tips to the theatre ushers (it is not expected, and usually theatre staff are not allowed to accept tips). - If you want to give a standing ovation wait until the end of the performance and try to be considerate to the people behind you. Musicals based on pop songs sometimes have a section at the end when the audience can stand and dance.